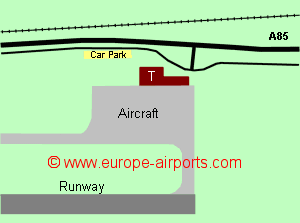 The runway (which cannot be easily extended) at Dundee airport is not long enough to accommodate Boeing 737's and therefore is not of use to the main airlines. The airport is however located on the edge of the city (beside the river) and there are hotels nearby. Taxis are available although prior booking is recommended. The train station is a 5 minute taxi ride from the airport. Facilities at Dundee airport include a cafe/shop. 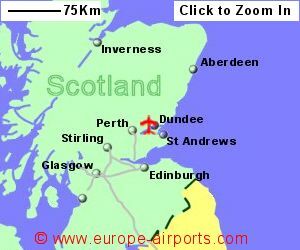 Sorry but we do not have any details of flights from Dundee Airport to the rest of Europe.